L. J. Engineering, Inc. develops and manufactures products for precision vacuum and pressure control, vacuum sensing applications, and a number of automatic parachute actuation devices and related support equipment. Recently developed products include our Model 493 Digital Wrist Altimeter Test Chamber, which is a high-accuracy, electronically-controlled altitude chamber used to test parachutists wrist altimeters. This test chamber features a digital display with preset altitude points, which allows single-button operation to advance to the next test altitude. Another recently developed product is our Model 480 Digital Altimeter and Vertical Velocity Indicator System for hypobaric chambers used to train aircrew personnel in a high altitude environment. U.S. Army, (automatic activation device for parachutes and related test equipment), various National Laboratories and Government Agencies, U.S. Air Force, NASA (breathing regulators used on Space Shuttle and Apollo missions.) 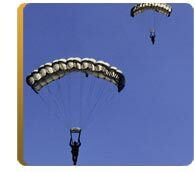 In addition, numerous foreign governments and military organizations utilize our equipment. GE Medical Systems, Molecular Devices, BIO-RAD Laboratories, Vision BioSystems, Edge Systems, ASML (division of Phillips), Boeing, Lake Shore Cryotronics, Inc., Palomar Systems (division of Electro Scientific Industries, Inc.), Spectrolab, Inc. (a Boeing Company). Additionally, our industrial vacuum regulators, vacuum controllers, digital vacuum gauges and digital pressure gauges are used extensively by countless laboratories, and industrial companies.